SpartanNash associates give back to their communities through volunteer efforts, building local relationships with one another and with their favorite nonprofit organizations and causes. Being a best-in-class business that feels local, where relationships matter takes every one of us—and for that reason, SpartanNash has continued to expand its volunteering efforts and celebrate the associates who give back with gifts of time and talent. Many of our associates have been volunteering for years or even decades, while others may be searching for the right opportunity to make a difference. As a company, we want to support our associates who have, on their own, made a commitment to volunteering, and we want to inspire other associates to begin or increase their volunteering efforts. In this way, we can continually build stronger communities for our families and neighbors. Volunteering is an important component of SpartanNash’s Corporate Responsibility commitment and a catalyst to building a winning culture. Volunteering helps improve the communities we serve, while building relationships, camaraderie, teamwork and a sense of pride and purpose in our service to others. 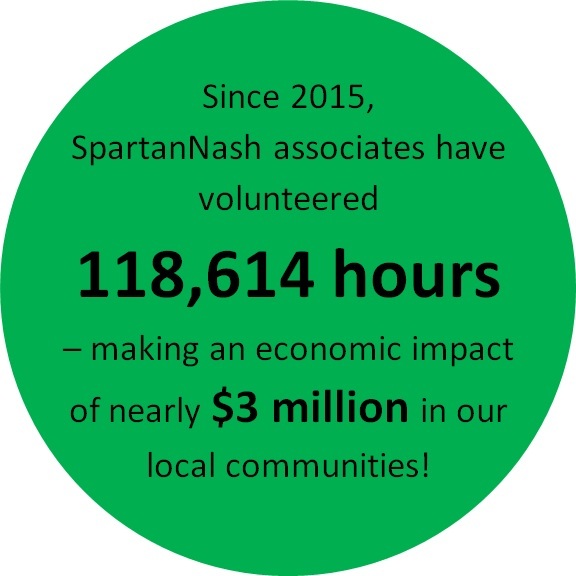 In 2018, SpartanNash associates volunteered 57,364 hours across the company, making an economic impact of more than $1.38 million on behalf of 1,153 nonprofit organizations. SpartanNash associates who record more than 100 volunteer hours in a calendar year join the 100 Club. Members then select their favorite 501(c)(3) nonprofit organization to receive a $100 donation in their name. This enables SpartanNash to recognize and reward those who go above and beyond in their volunteering efforts. In 2018, 156 associates joined the 100 Club. Our company vision is to be a best-in-class business that feels local, where relationships matter. Supporting and encouraging volunteerism helps us live our vision and allows us to recognize our associates who also value volunteering. Since 2011, our Minneapolis Service Center has hosted an annual Helping Hands in the Community Day – a day of community service where associates complete group volunteer projects at various local nonprofits. In 2016, Helping Hands was expanded to SpartanNash’s corporate headquarters in Grand Rapids, Mich. and its MDV military division in Norfolk, Va.
Over the last seven years, associates have contributed more than 25,000 hours at nearly 50 community partners. As our associates give back, they quickly learn how much they receive in the process. Helping Hands days help us better connect with our Foundation grant recipients, community partners and coworkers.